11. Princess Andrew's Meander Tiara: Elizabeth's new mother-in-law parted with not one but two tiaras in 1947. Her diamond and aquamarine tiara was used to make Elizabeth's engagement ring and Philip's wedding gift to her, a diamond bracelet. Alice also gave Elizabeth a tiara as a wedding present: this diamond and platinum tiara. The piece features two traditional Greek design elements, the laurel wreath and meander, which is also known as a Greek key. Elizabeth has never been photographed in the piece, although she's surely worn it privately. In 1972, she gave the tiara to her daughter, Princess Anne, who loaned it to her daughter, Zara Phillips, for her 2011 wedding. 12. The Girls of Great Britain and Ireland Tiara: The second, and perhaps more important, tiara that Elizabeth received as a wedding present was this diamond, silver, and gold diadem. Made in 1893, it was a wedding gift to Queen Mary from a committee of British women (the "Girls of Great Britain and Ireland"). At some point the lozenge-patterned base was separated from the rest of the tiara, but in 1947, Mary gifted both the tiara and its bandeau base to her granddaughter, Princess Elizabeth. 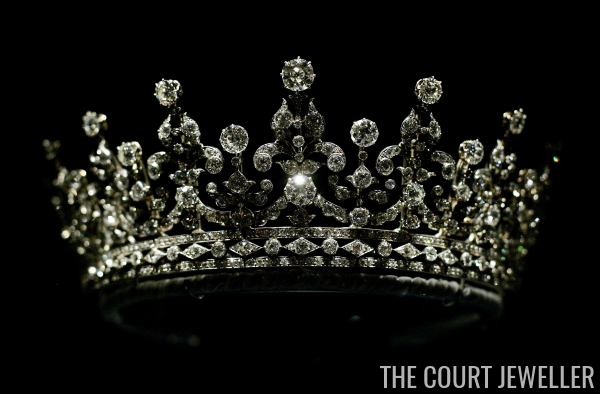 The Queen has acquired numerous other tiaras during her ninety years, but this one has always remained a favorite, and today it's easily her most-worn tiara. 13. The Dorset Bow Brooch: Queen Mary gave multiple additional jewel gifts to her granddaughter for her wedding. Another of the major pieces was this brooch, made of diamonds, gold, and silver by Carrington in 1893. It was also one of Mary's wedding presents, a gift from the county of Dorset. The pieces is one of the largest of the diamond bow brooches in the Queen's current collection, and she's worn it regularly since her wedding. 14. The Boucheron Ruby and Diamond Necklace: Princess Elizabeth's parents were generous in their wedding gifts to their elder daughter; this generosity was enabled, in part, by the large cache of jewels that her mother had inherited from Mrs. Greville five years earlier. The necklace was made by Boucheron for Mrs. Greville in 1907. Elizabeth wore it quite a lot in the years after her wedding, but the deep vee-shape of the necklace makes it a bit of a challenge to wear, so it probably comes as no surprise that she's largely kept this one in the vaults in recent years. 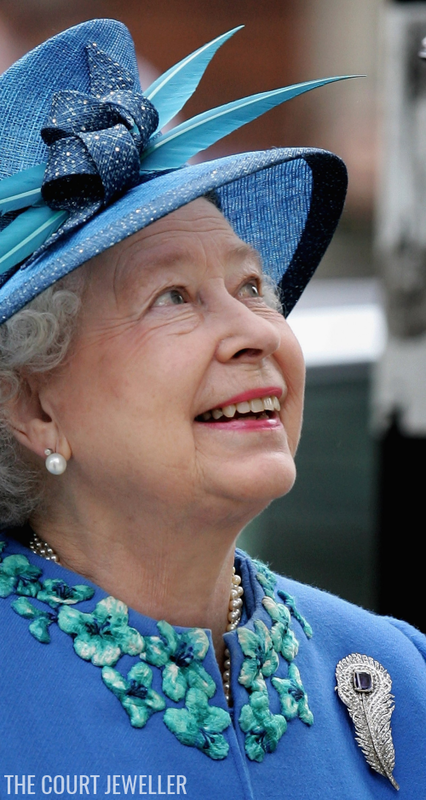 In the photograph above, she's also wearing another of Queen Mary's wedding gifts: the Rose of York Bracelet. 15. The Greville Chandelier Earrings: Elizabeth's parents also dipped into the Greville bequest to present her with a pair of magnificent diamond chandelier earrings to celebrate the wedding. Made in 1929 by Cartier, the earrings feature a variety of cuts of diamonds set in platinum. For many years, these were some of Elizabeth's go-to gala earrings, but in recent years, they've been seen far less. In the portrait above, taken after Elizabeth became queen, she wears the earrings with three other important wedding gifts: the City of London Necklace, Queen Mary's bangles, and a portion of Queen Mary's stomacher. 17. The Carrington Feather Brooch: This lovely feather-shaped diamond and sapphire brooch was given to Elizabeth as a wedding present by Carrington and Co., a British jewelry firm. The beautiful, classic design of the brooch has earned it a prominent place in Elizabeth's jewelry box throughout her reign. 18. The City of London Fringe Necklace: This diamond, silver, and gold necklace was given to Elizabeth as a wedding present by a number of important financial figures from the City of London. Made in the nineteenth century, the necklace is a rare example of a fringe that is not convertible to a tiara, as it is threaded on silk. Above, she wears the necklace with two other wedding gifts: the Nizam of Hyderabad Tiara and Queen Mary's bangle bracelets. 19. The Nizam of Hyderabad Parure: The Nizam of Hyderabad gave Elizabeth perhaps the best wedding gift of all: her choice of jewelry from Cartier. She selected a suite of diamond floral jewelry, including a tiara, which included floral elements that could be detached and worn as brooches, and an elaborate necklace. The Queen eventually had the tiara dismantled, but she still has the brooches and the necklace, which she has loaned recently to the Duchess of Cambridge. 20. The Williamson Diamond: Canadian gemologist Dr. J.T. Williamson offered Elizabeth a truly astonishing wedding gift: a pink diamond measuring more than 23 carats. Found only a month before the wedding, it's still considered the finest pink diamond ever to have been discovered. The stone was eventually set into a diamond and platinum brooch by Cartier, and the Queen still wears it, especially for very important daytime engagements.